In addition, they seek to perform works from the trove of composers with whom Horszowski had personal contact, such as Ravel, Saint-Saëns, Fauré, Martinu, Villa-Lobos, and Granados. 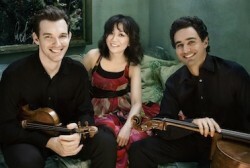 Their debut recording, an album of works by Fauré, Saint-Saëns, and D’Indy – in memory of Mieczysław Horszowski – was released by Bridge Records in 2014. 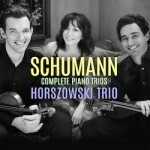 Gramophone called them “a highly accomplished group,” and raved: “exemplary performance… I long to hear more of the Horszowski Trio.” After their successful debut recording, they have two more upcoming projects: an All-Schumann Piano Trios disc, as well as an All-Brahms Piano Quartets set with Masumi Per Rostad from the Pacifica Quartet.